Effetec supports the biathlon talk show - Effetec s.r.o. On October 24, 2017 at 6 pm a gala evening will take place in the premises of the Lanškroun Chateau, where a talk show and autograph session will take place, with the director of the biathlon team, Ondrej Rybář, and the most successful biathlon athlete Ondřej Moravec. The evening will be attended by Tomáš Lachman, sports commentator of Czech Television. Entrance to the discussion is free of charge. This evening will be supported also by Effetec, a manufacturer of large-format digital UV printers. At this festive social and sporting evening, you can see, among other things, prints from printers manufactured by Effetec. We once again decided to support a socio-cultural event because this company is very close to the mentality of athletes and the surrounding environment. Similarity is in the sense of fair play and toughness to go for your goal. This time, Effetec decided to support this evening organized by Mr. František Trkal, who represents the Cyklotrenink František Trkal. 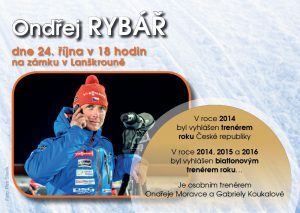 The talk is organized with one of the best athletes, representing the biathlon. Not only are we looking forward, but we all cordially invite you to this evening. We are very curious about the moments when Ondřej Moravec are going to represent and fight in this winter sport for the Olympic medals at Winter Olympics. Ondřej Moravec (* June 9, 1984, Ústí nad Orlicí) is a Czech biathlon athlete, a regular participant in the World Cup, the World Championships and the Olympic Games. He is a three-time Olympic medalist at the 2014 Winter Olympics in Sochi, Russia, where he won two silver medals and one bronze.